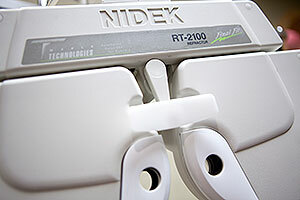 When we examine your eyes, we use the latest equipment in visual analysis. Our computers estimate any glasses prescription you may need before you even enter the exam room! We use computerized equipment to quickly and painlessly determine the eye’s visual acuity, focusing ability, and power. Our advanced diagnostic instruments assess the overall health of the eyes, checking for glaucoma, macular degeneration, cataracts, and other sight-threatening conditions. We perform pre-Kindergarten and pre-military exams as well as DMV evaluations. We also examine people with diabetes and those on Plaquenil treatment. As with so many other health conditions, eye diseases can become very advanced before they have symptoms that you notice. Glaucoma, for instance, is known as the “silent robber of sight” because it causes significant, irreversible damage before you feel any pain or notice a blind spot in your vision. Fortunately, just like other diseases, early detection usually leads to easier treatment. Remember, eye exams don’t hurt. So don’t forget to take care of your precious sight. Our doctors received four years of post-graduate training in the treatment and management of eye disease and visual disorders. They are licensed to diagnose any eye disease and to prescribe medications for treatment. They can examine children as young as six months old. Many people, particularly in the Tri-Valley, suffer from symptoms such as dryness, itching, stickiness, and eye pain. Treatment for these symptoms is usually straightforward. You don’t have to suffer, even if you’ve tried to seek help before. New advances in diagnosis and treatment in the last 5 years have really made a difference for so many people. We commonly treat eye infections, allergies, dry eyes, scratched eyes, sudden loss of vision, and small items stuck in the eye. We can also help you with cataracts, glaucoma, macular degeneration, and other eye diseases. Of course, if you have a severe eye injury or other sight-threatening emergency, you should go straight the nearest emergency room. Regular vision testing and evaluations ensure that you always have the clearest vision possible. Our Livermore optometrists provide regular vision acuity test as part of a comprehensive eye exam. Our doctors will measure how each eye is seeing by using a wall eye chart and a reading eye chart. The results of these tests are portrayed as a fraction, with 20/20 being the standard for normal distance and reading vision. Depending on the results of your vision test, our doctors may prescribe corrective glasses, contacts, or eye exercises. In addition to vision testing, an eye exam in our Livermore office includes testing eye functionality. Our optometrists perform several tests to evaluate depth perception, color vision, eye muscle capabilities, peripheral vision, and responsiveness to light. Several other simple tests are completed to determine whether the eyes are focusing, moving, and working together properly. The test results enable our doctors to diagnose any underlying conditions that may be impairing the eyes ability to focus or work together. 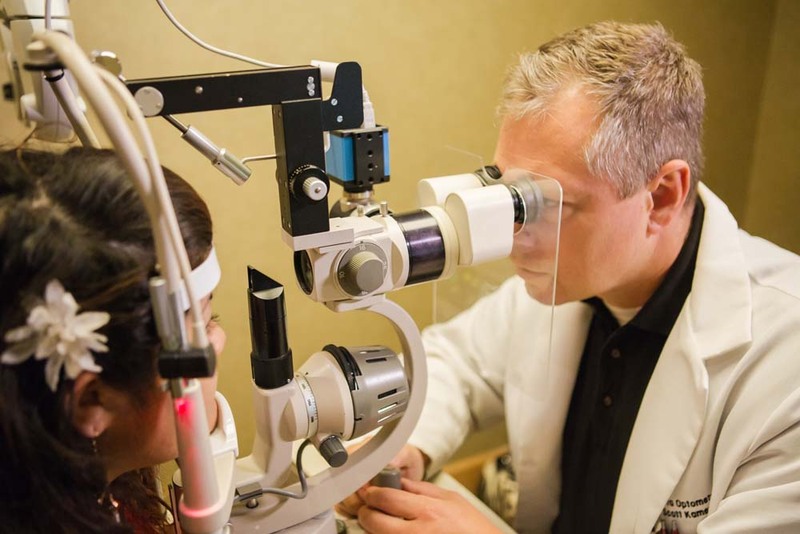 As part of a comprehensive eye exam, our Livermore optometrists examine the overall health of the eye through a visual examination and tonometry. The doctors evaluate eye health by visually inspecting the eye and eyelids using magnification and a bright light. To examine the internal structures of the eye, we may dilate the pupils. Increased eye pressure may be an indicator of glaucoma, so we utilize tonometry to measure eye pressure. After completing these short tests, our doctors review the results and discusses an treatments with you. Contact us at (925) 443-3553 today to schedule a comprehensive eye exam.